Prince Edward Island bills itself as a bucolic haven of pristine beaches, white clapboard farmhouses, and quaint fishing villages. But the province is also home to one of the scariest places I’ve ever visited. There, in 2002, I toured a small warehouse-like building housing a dozen aquariums containing salmon that were genetically modified to grow twice as fast as normal salmon. In one tank, a biologist showed me fish that were about the size of hot dogs. In an adjacent tank, salmon easily the size of my forearm paddled in listless circles. The fish in the two tanks were exactly the same age and had been fed identical diets. The giants, however, carried a gene that from a cold-water dwelling ocean pout that continuously enabled them to produce a growth hormone. Normal salmon stop excreting growth hormones when water temperatures cool. So far, the Frankenfish have been confined to the laboratory. But that may change. 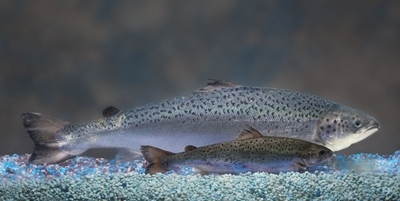 Last week, AquaBounty Technologies, the company that bioengineered the salmon, told the New York Times that it had completed most of the steps required for Food and Drug Administration approval. “Perhaps in the next few months, we expect to see a final approval,” Ronald Stotish, the company’s president said to the Times. Shortly after visiting the P.E. I. laboratory, I began steering clear of farmed salmon. AquAdvantage’s pending approval is yet another reason I’m glad I did. Remember acid rain? The stuff that was killing our lakes and denuding our mountain tops? The stuff that was supposed to be a thing of the past, thanks to reduced sulfur dioxide emissions? Well, acid rain is back and worse than ever, only this time the culprit isn’t coal-fired power plants, it’s farms. Writing on Grist, an environmental website, Tom Laskawy, in his usual clearheaded way, explains that industrial has given us an acidic “double-whammy.” Chemical fertilizers spread on fields produce ammonia vapor. Feedlots full of tens of thousands of animals fed crops grown on those fields also emit ammonia. All that ammonia produces nitric acid, which returns to the earth as poisonous rain, that as as Laskway points out is even worse for the environment that the sulfuric acid emissions of yore. His article makes for a chilling must read on a drizzly summer’s day. During the recession, the market for organic milk tanked, along with the rest of the economy. In an unprecedented move, Organic Valley, the country’s largest organic dairy, told the 1,600 farmers that supply it with milk to cut their production by 7 percent. It enabled the company to keep paying the same rate for the milk it purchased, which is about twice what conventional milk sells for. Interestingly, Siemon’s announcement came about the same time that Agriculture Secretary Tom Vilsack was meeting in Wisconsin, Organic Valley’s home state, with 500 dairy farmers, industry representatives, and politics from across the country to hear grievances about the on-going dairy crises. At that meetings, there were pleas to change the milk-pricing formula and calls to prosecute big dairy firms for antitrust violations. But I didn’t read any mention of an approach that worked in at least one proven case: supply management. « Monsanto Claims Victory in Supreme Court GM Seed Case, But Who Really Won?